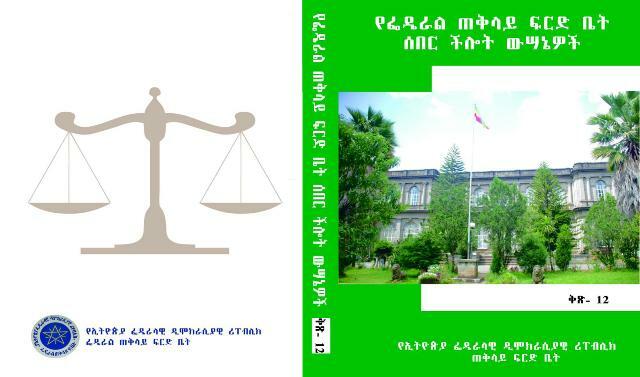 It took almost a year for the Supreme Court to officially release its Cassation decisions which are suppose to be binding on all lower courts in Ethiopia on similar cases requiring interpretation of the law. All these decisions, compiled in two volumes (volume 11 and 12) include decisions rendered in the previous year i.e. 2003 Ethiopian calender. Delay of Publication has been and is still continuing to be one of the major setbacks for the proper application of the rule of precedent in Ethiopia. It also raises some serious legal issues as the binding effect of a cassation decision not officially published is not clear.The Federal Courts Proclamation Re-amendment Proclamation No.454/2005, which makes Interpretation of a law by the Federal Supreme Court rendered by the cassation division with not less than five judges binding on federal as well as regional courts, simply imposes on the Federal Supreme Court a duty to publish decisions of the cassation division that contain binding interpretation of laws to all levels of courts and other relevant bodies, without indicating whether decisions are still binding before the time of publication. who gave you the permission to post these eh? I heard zat Vol 13 has been published where is z copy ofzis Vol? Please send me the previous publication. It is extreemely important for lawyers, specially. it is interstig news for all lawyer’s in ethiopia. Thanks to see,supreme court, in the global computer village. Thank u to see, supreme court, in global computer village. Can you send volume 1-12 for me? Lower courts could also freely access the blog or the face book page. Thanks 4 pointing out such problem.Iwork at worda court,but still we do not have such mandatory dessions,this is how grave z problem is! CAN IT BE POSSIBLE FOR YOU TO SEND FOR EACH INDIVIDUAL EMAIL? I’m very happy to find volume 11 and 12 but if you can either upload volume 8-10 or send it to if its not too much trouble it would be great. Thanks.